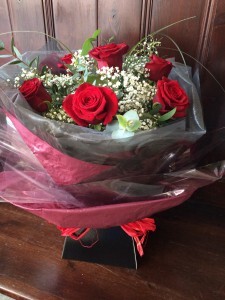 We are now taking orders for Valentines Day Thursday 14th February 2019, you can order flowers for delivery or for collection from our shop here in Sutton Coldfield. Make this Valentines Day extra special by giving a beautiful bouquet of flowers. 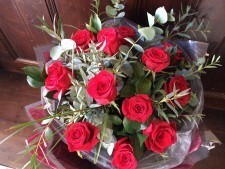 Red Roses are the classic Valentines gift you can choose either a dozen, half a dozen or a single rose. We have put together a few romantic designs for you to choose from, if roses aren't what your looking for then we can create something special to your requirements. Place your Order Early to avoid disappointment! If you would like to place your order via telephone our phoneline is open 9:15am - 8:00pm 7 days a week. 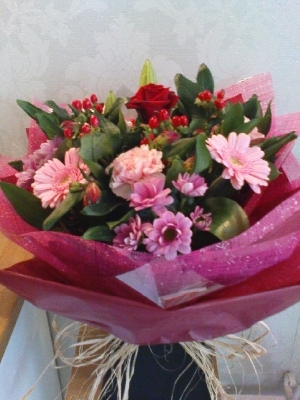 call us on 0121 382 4111 to place your order. 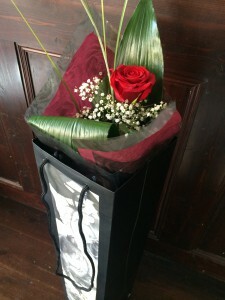 A simple but stunning large headed long stemmed red rose with gypsophilia, aspidistra leaf and bear grass foliage, beautifuly presented in a presentation gift bag. 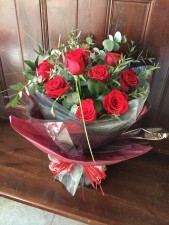 Hand-tied aqua as pictured to include a single red rose in the centre of the bouquet with a mixed selection of flowers and colours £27.50 or for a larger selection of flowers and more roses prices as below. 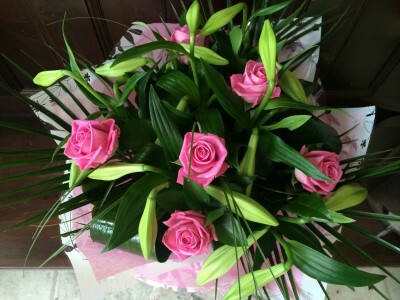 A stunning bouquet of half a dozen (6) roses arranged with gypsophilia, eucalyptus, aspidistra and bear grass. It comes aqua packed for freshness, beautifuly gift wrapped and presented in a modern presentation box finished with a raffia bow. Beautiful Selection of 6 Roses and 6 Lilies for your valentine beautifully arranged as Handtied Aqua in presentation box.